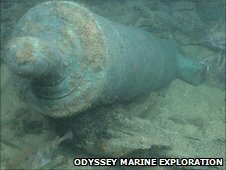 An archaeologist has called for the wreck of the HMS Victory to be brought to the surface to avoid further damage. Dr Sean Kingsley is an archaeological consultant for Odyssey Marine Exploration, who found the shipwreck in the English Channel in April 2008. He said the site would continue to suffer damage from bottom fishing and could not be protected by exclusion zones as it is too far from land. The site's future is the subject of a public consultation ending on 30 June. The consultation, being held by the UK government's Department of Culture, Media and Sport and the Ministry of Defence, puts forward three options; manage the site with no excavation, limited excavation and management of the site and full excavation with the artefacts being used to educate and celebrate Britain's heritage. Dr Kingsley said: "Sometimes you can leave ships in shallow waters, you can protect them, you can create exclusion zones, people can dive on them and the money from that can contribute to local economies. When you're out of the sight of land, 100m down it's just not an option. "It seems to us the most responsible and sustainable option it is take that ship out of harm's way, put it on shore for education and promoting heritage so that everyone can enjoy it." More than 1,000 sailors drowned when the British flagship, the predecessor to Lord Nelson's Victory, sank in a storm in 1744.